We are delighted to be performing at Drumlithie Village Hall in aid of the Aberdeen Neo-Natal Unit. All profits go to this great cause so get yourselves down there in support. 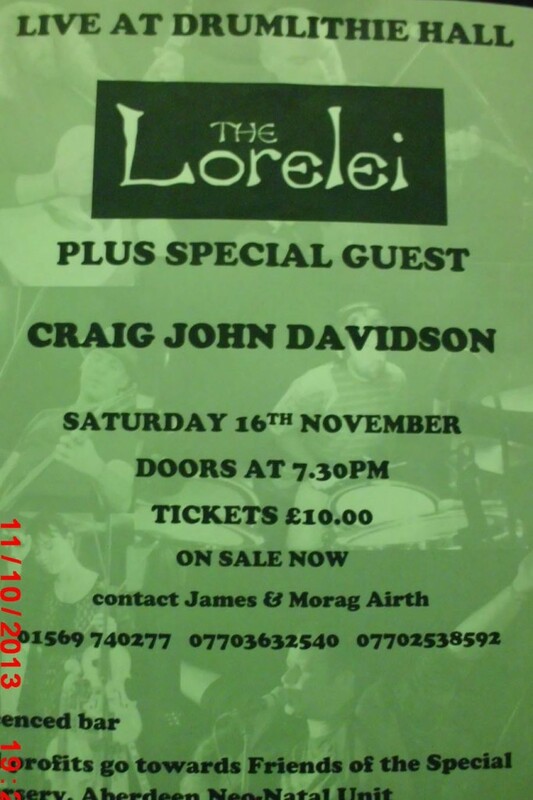 It will be another first for us with a gig in Drumlithie and we are very privileged to be joined once more by Fat Hippy label mate Craig John Davidson. Tickets: £10 at Steeple Shop or contact Morag & James on 01569 740277 or 07703632540. With a unique blend of rock, folk, indie, punk, thrash The Lorelei have been bringing pleasure to crowds across the UK since the early 90's. Their energy never seems to subside and their live shows never fail to get the crowd moving. "The Lorelei have managed to create a new musical genre – Total Thrash Speed Folk."